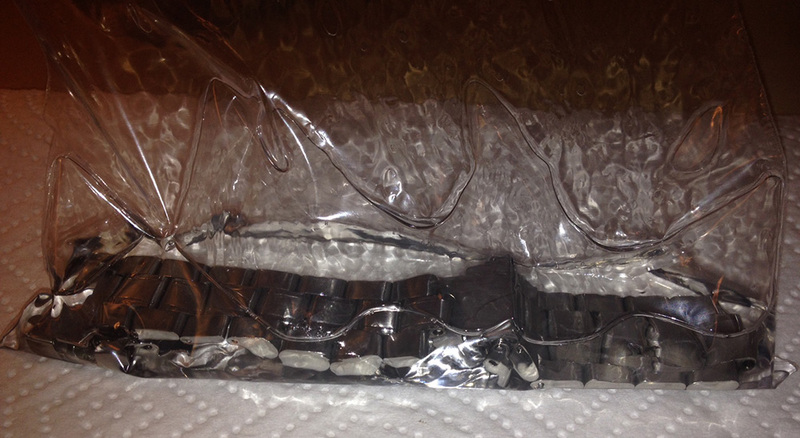 Is your metal watch bracelet not as loose and fluid as you would like? Maybe it squeaks on your wrist? Good news, there is a simple fix that will make your bracelet smooth as butter and is good for your skin to boot! 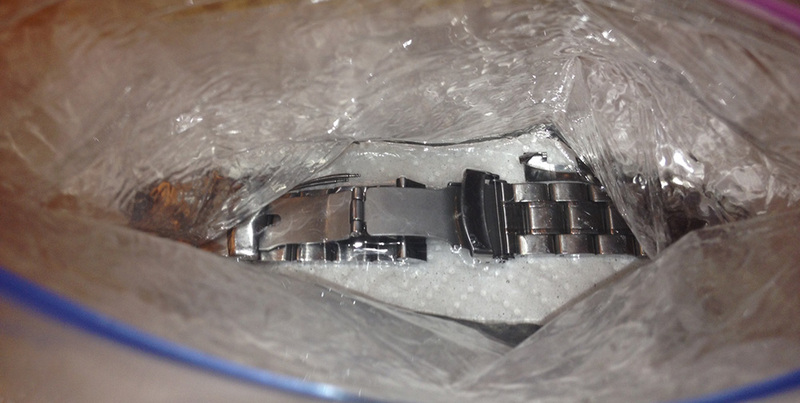 That’s right, we’re going to soak that watch bracelet in Baby Oil (or mineral oil if you prefer). If you like the smell of baby oil head on over to the childcare section of your favorite pharmacy, or if you prefer you can get it on Amazon as well. Baby oil is just mineral oil with a pleasant scent added, so if you don’t want the added scent, no problem! You can find 100% mineral oil in the isle alongside the laxatives, or you can find it on Amazon too. You do not want to soak the entire watch in mineral oil, only the bracelet, so the first step will be to use a spring bar tool to remove the bracelet from the watch head. With that done I usually take this opportunity to wash the bracelet with my ultrasonic cleaner. If you don’t have an ultrasonic cleaner you can use a soft toothbrush with a mild detergent instead. Dish soap works well to clean out any gunk that might have gathered within the links or under the clasp. This is assuming this isn’t a brand new watch, in which case you can skip this step. Next you’ll want to put your bracelet in a zip-lock bag and pour a small amount of baby oil in. You’ll want just enough to completely submerge the entire bracelet. Work the baby oil into the bracelet by rolling the bag around in your hand and manipulating the bracelet inside the bag. You want to work the baby oil into all of the small crevices in the bracelet. Once you are satisfied that you’ve got it all worked in you can set the bag aside and let it sit overnight. When you are ready to take the bracelet out make sure you have paper towels nearby! This stuff gets everywhere. Remove the bracelet and lay it on the paper towels. Let it sit for a few minutes while the excess oil seeps out. Once that is done grab a fresh paper towel and dry the bracelet, end links, and spring bars as best as you can. Next I usually let the bracelet sit in a sunny window for a couple hours. This will help to draw the excess baby oil out which can then be dabbed away with a fresh paper towel. With that done I suggest taking this opportunity to polish the links with a jeweler’s cloth. 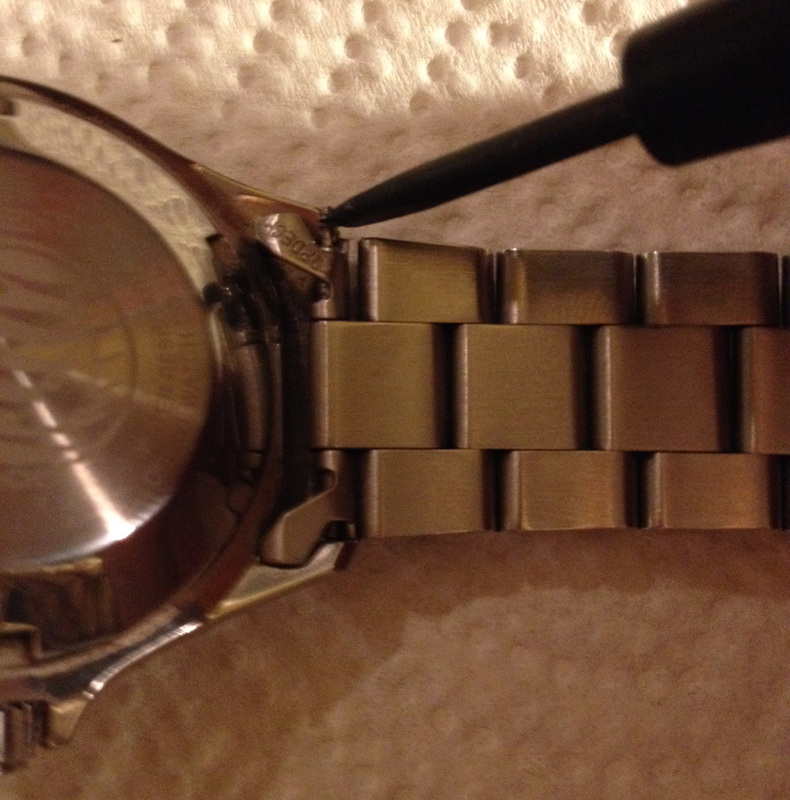 With the bracelet detached from the watch head you should be able to polish every little corner to a beautiful shine. All that’s left now is to reattach the bracelet to the watch head and enjoy your hard work. Small amounts of baby oil may leak out for the next day or two, but don’t worry, it’s good for your skin and smells great!